Since Sheepbridge Vintage Club was formed 5 years ago by local men Tony Kerr and Dessie Turley, it has sucessfully managed to raise in the region of £20,000 towards benefiting many local charites. Each year a tractor run has been held during early July and a thrashing and fun day towards the end of September, both events have always been well supported and enjoyed by the local community. PIPs Newry & Mourne would like to sincerely thank Sheepbridge Vintage Club for their fundraising efforts. 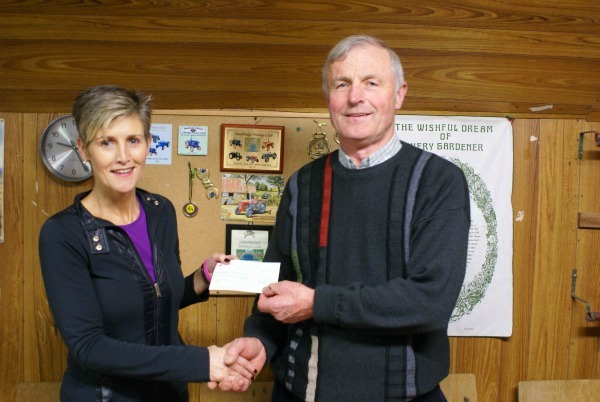 The Sheepbridge Vintage Club would like to thank the local community for their support in raising £500 for PIPS Newry and Mourne and also like to extend their gratitude to Francis and Adrian Turley for the used of their premises for the club meetings, long may it continue. Pictured are Attracta Brown PIPS Newry and Mourne and HughTurley Sheepbridge Vintage Club.